Suriname, officially the Republic of Suriname, is a country in northern South America that is rich in bauxite, although gold and oil reserves are now being explored and developed. Formerly known as Dutch Guiana, Suriname is situated between French Guiana to the east and Guyana to the west. The southern border is shared with Brazil and the northern border is the Atlantic coast. It claims two disputed territories totaling some 6,800 square miles (17,612 sq km) in the southwest and southeast, bordering on Guyana and French Guiana, respectively. The country is the smallest state in terms of area and population in South America. As a plantation colony, Suriname was heavily dependent on manual labor, originally slaves and later contract laborers from the Dutch East Indies and India, as well as China and the Middle East. Although Suriname's population remains relatively small, because of its history it is one of the most ethnically and culturally diverse countries in the world. Suriname is the smallest independent country in South America. Situated on the Guiana Shield, a unique geological formation, the country can be divided into two main geographic regions. The northern, lowland coastal area (roughly above the line Albina-Paranam-Wageningen) has been cultivated, and most of the population lives here. The southern part consists of tropical rainforest and sparsely inhabited savanna along the border with Brazil, covering about 80 percent of Suriname's land surface. 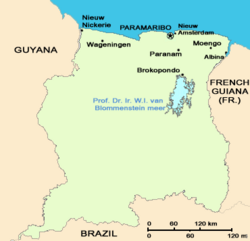 There are two main mountain ranges in Suriname: The Bakhuys Mountains and the Van Asch Van Wijck Mountains. Julianatop is the highest mountain in the country at 4,219 ft (1,286 m) above sea level. Other mountains include Tafelberg (3,366 ft; 1,026 m), Mount Kasikasima (2,356 ft; 718 m), Goliathberg (1,174 ft; 358 m), and Voltzberg (787 ft; 240 m). Lying near the equator, Suriname has a tropical climate, and temperatures do not vary much throughout the year. The year has two wet seasons, from December to early February and from late April to mid-August. Located in the northeast portion of the country is the Brokopondo Reservoir, one of the largest reservoir lakes in the world. It was created in 1964, by the Afobakka dam, built to provide hydroelectric power for the bauxite industry (which consumes about 75 percent of the output) and for domestic consumption. In the upper Coppename River watershed, the Central Suriname Nature Reserve is a UNESCO World Heritage Site cited for its unspoiled rainforest biodiversity. There are many national parks in the country: Galibi National Reserve, Coppename Manding National Park and Wia Wia NR along the coast, Brownsberg NR, Raleighvallen/Voltzeberg NR, Tafelberg NR and Eilerts de Haan NP in the center and the Sipaliwani NR on the Brazilian border. In all, 12 percent of the country's land area is devoted to national parks and lakes. 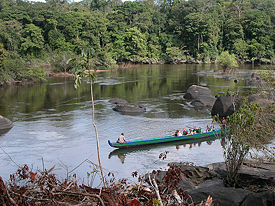 The Central Suriname Nature Reserve comprises a range of topography and ecosystems. Its montane and lowland forests contain a high diversity of plant life with almost 6,000 plant species collected. There are viable populations of animals typical of the region, including jaguar, giant armadillo, giant river otter, tapir, sloths, and eight species of primates, as well as 400 bird species. The indigenous Surinen, from whom the country's name derives, were the area's earliest known inhabitants. By the sixteenth century, however, the Surinen had been driven out by other native South American Indians, namely the Arawak and Carib tribes. 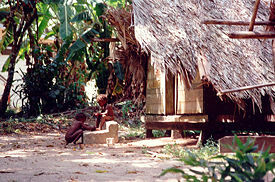 The village Santigron in Suriname, a Maroon village in the rainforest. Some 20,000 Maroons, (from the French term marron, meaning "fugitive") descendants of Suriname's escaped slaves, are still living in Suriname's rainforest having retained their most original and traditional Afro-American culture. Photo taken May 2006. European exploration of the area began in the sixteenth century by Dutch, French, Spanish, and English explorers. In the seventeenth century, plantation colonies were established by the Dutch and English along the many rivers in the fertile Guyana plains. In the Treaty of Breda, signed in 1667, the Dutch opted to keep the nascent plantation colony of Suriname conquered from the British, while leaving the small trading post of New Amsterdam in North America, now New York City, in the hands of the British. The Dutch planters relied heavily on African slaves to cultivate the coffee, cocoa, sugar cane, and cotton plantations along the rivers. Treatment of the slaves by their owners was notoriously bad, and many slaves escaped the plantations. With the help of the native South Americans living in the adjoining rainforests, these runaway slaves established a new and unique culture that was highly successful in its own right. Known collectively in English as the Maroons, and in Dutch as "Bosnegers," (literally, "Bush negroes"), they actually established several independent tribes, among them the Saramaka, the Paramaka, the Ndyuka or Aukan, the Kwinti, the Aluku or Boni, and the Matawai. The Maroons would often raid the plantations to recruit new members and acquire women, weapons, food, and supplies. These attacks were often deadly for the planters and their families, and after several unsuccessful campaigns against the Maroons, the European authorities signed peace treaties in the nineteenth century, granting the Maroons sovereign status and trade rights. Slavery in Suriname was abolished by the Netherlands in 1863, but the slaves were not fully released until 1873, after a mandatory ten-year transition period during which they were required to work on the plantations for minimal pay and without state-sanctioned torture. As soon as they became truly free, the slaves largely abandoned the plantations where they had suffered for several generations, in favor of city living in Paramaribo. As a plantation colony, Suriname was still heavily dependent on manual labor, and to make up for the shortfall, the Dutch brought in contract laborers from the Dutch East Indies (modern Indonesia) and India) through an arrangement with the British. In addition, during the late nineteenth and early twentieth centuries, small numbers of mostly men were brought in from China and the Middle East. Although Suriname's population remains relatively small, because of this history it is one of the most ethnically and culturally diverse in the world. 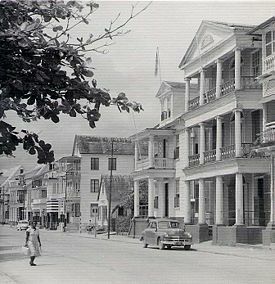 In 1954, the Dutch placed Suriname under a system of limited self-government, with the Netherlands retaining control of defense and foreign affairs. In 1973, the local government, led by the NPK (a largely Creole, meaning ethnically African or mixed African-European, party) began negotiations with the Dutch government leading toward full independence, which was granted on November 25, 1975. 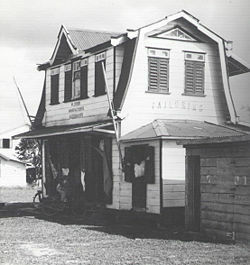 The severance package was substantial, and a large part of Suriname's economy for the first decade following independence was fueled by foreign aid provided by the Dutch government. The first president was Johan Ferrier, the former governor, with Henck Arron (leader of the Suriname National Party) as prime minister. Nearly one-third of the population of Suriname emigrated to the Netherlands in the years leading up to independence, as many people feared that the new country would fare worse under independence than it did as an overseas colony. Suriname's diaspora therefore includes more than a quarter of a million people living in the Netherlands, including several recent members of the Dutch national football (soccer) team. On February 25, 1980, a military coup sidelined the democratic government, beginning a period of economic and social hardship. On December 8, 1982, a group of 13 dissidents, including a newspaper editor, two human-rights lawyers, and several labor leaders, were executed. The Netherlands quickly suspended all foreign aid. A military regime led by Desi Bouterse as chairman of the National Military Council controlled Suriname from 1980 until the beginning of the 1990s. As one of the wealthiest people in Suriname, he made his fortune in gold and forestry-related businesses, but claimed to be a socialist, when he took control of the nation. Bouterse and 24 co-defendants were brought to trial 25 years later for allegedly instigating the "December Murders." The trial was to have begun in November 2007, before a military tribunal (however, Bouterse is still standing trial as of August 2008). "We need to do this for our history, for our children," said Betty Goede, the head of a local human-rights group that had spent nearly a decade fighting to try the case. Bouterse has been accused on various occasions of involvement in illegal drug trafficking. In July 1999, he was convicted in absentia in the Netherlands for cocaine-trafficking. The Netherlands has an international warrant for his arrest, which makes it almost impossible for him to leave Suriname. By law, Suriname cannot deliver him because he is a former head of state. Elections were held in 1987, and a new constitution was adopted, which among other things allowed the dictator to remain in charge of the army. Dissatisfied with the government, Bouterse summarily dismissed them in 1990, by telephone, an event that became popularly known as "the telephone coup." Bouterse's power began to wane after the 1991 elections, however, and a brutal civil war between the Suriname army and the Maroons loyal to Ronnie Brunswijk further weakened his position during the 1990s. Suriname's democracy gained strength after the turbulent 1990s, and its economy became more diversified and less dependent on Dutch financial assistance. Bauxite (aluminum ore) mining continues to be a strong revenue source, but the discovery and exploitation of oil and gold has added substantially to Suriname's economic independence. Agriculture, especially of rice and bananas, remains a strong component of the economy, and ecotourism is providing new economic opportunities. More than 80 percent of Suriname's landmass consists of unspoiled rainforest, and with the establishment of the Central Suriname Nature Reserve in 1998, Suriname signaled its commitment to conservation of this precious resource. The reserve became a UNESCO World Heritage Site in 2000. The Republic of Suriname is a constitutional democracy based on the 1987 constitution. The legislative branch consists of a 51-member unicameral National Assembly, simultaneously and popularly elected for a five-year term. The president, who is elected for a five-year term by a two-thirds majority of the National Assembly or, failing that, by a majority of the People's Assembly, heads the executive branch. If at least two-thirds of the National Assembly cannot agree to vote for one presidential candidate, a People's Assembly is formed from all National Assembly delegates and regional and municipal representatives who were elected by popular vote in the most recent national election. As head of government, the president appoints a 16-minister cabinet. There is no constitutional provision for removal or replacement of the president unless he resigns. The judiciary is headed by the Court of Justice (Supreme Court). This court supervises the magistrate courts. Members are appointed for life by the president in consultation with the National Assembly, the State Advisory Council and the National Order of Private Attorneys. In April 2005, the regional Caribbean Court of Justice, based in Trinidad, was inaugurated. As the final court of appeal, it was intended to replace the London-based Privy Council. The country is divided into ten administrative districts, each headed by a district commissioner appointed by the president. The commissioner is similar to the governor of a United States-type state but is appointed and removed by the president. Since gaining independence, Suriname has become a member of the United Nations, the Organization of American States, and the Non-Aligned Movement. Suriname is a member of the Caribbean Community and Common Market and the Association of Caribbean States; it is associated with the European Union through the Lome Convention. Suriname participates in the Amazonian Pact, a grouping of the countries of the Amazon Basin that focuses on protection of the region's natural resources from environmental degradation. Reflecting its status as a major bauxite producer, Suriname is also a member of the International Bauxite Association. The country also belongs to the Economic Commission for Latin America, the Inter-American Development Bank, the International Finance Corporation, the World Bank, and the International Monetary Fund. Suriname became a member of the Islamic Development Bank in 1998. At independence, Suriname signed an agreement with the Netherlands providing for about $1.5 billion in development assistance grants and loans over a 10 to 15-year period. Initial disbursements amounted to about $100 million per year, but they were discontinued during military rule. After the return to a democratically elected government in 1991, Dutch aid resumed. The Dutch relationship continued to be an important factor in the economy, with the Dutch insisting that Suriname undertake economic reforms and produce specific plans acceptable to the Dutch for projects on which aid funds could be spent. In 2000, the Dutch revised the structure of their aid package and signaled to the Surinamese authorities their decision to disburse aid by sectoral priorities as opposed to individual projects. In 2001 both governments agreed to spend the remaining development funds to finance programs in six different sectors: health care, education, environment, agriculture, housing, and governance. Relations with the Dutch have been complicated by Dutch prosecution of Desi Bouterse in absentia on drug charges, and by legal maneuvering by Dutch prosecutors trying to bring charges relating to the December 1982 murders. A Dutch appellate court in 2000 found Bouterse guilty of one drug-related charge; the decision was upheld on appeal. But finally, in April 2008, the wealthy former ruler was facing trial. Bilateral agreements with several countries of the region, covering diverse areas of cooperation, have underscored the government's interest in strengthening regional ties. The return to Suriname from French Guiana of about 8,000 refugees of the 1986-1991 civil war between the military and domestic insurgents has improved relations with French authorities. Long-standing border disputes with Guyana and French Guiana remain unresolved. Negotiations with the government of Guyana brokered by the Jamaican prime minister in 2000 did not produce an agreement, but the countries agreed to restart talks after Guyanese national elections in 2001. In January 2002, the presidents of Suriname and Guyana met in Suriname and agreed to resume negotiations, establishing the Suriname-Guyana border commission. In 2004, Guyana brought Suriname before the United Nations Convention on the Law of the Sea in a case regarding the maritime border dispute; a decision in favor of Guyana was issued in 2007. An earlier dispute with Brazil ended amicably after formal demarcation of the border. Suriname is a growing transshipment point for South American drugs destined for Europe via the Netherlands and Brazil and a transshipment point for arms-for-drugs dealing. Surinamese armed forces consist of the national army under the control of the minister of defense and a smaller civil police force, which is responsible to the minister of justice and police. The national armed forces comprise some 2,200 personnel, the majority of whom are deployed as light infantry security forces. A small air force, navy, and military police also exist. The Netherlands has provided limited military assistance to the Surinamese armed forces since the election of a democratic government in 1991. In recent years, the United States has provided training to military officers and policymakers to promote a better understanding of the role of the military in a civilian government. Since the mid-1990s, the China has been donating military equipment and logistical material to the Surinamese armed forces. The Netherlands, France, Venezuela, and Brazil also have working relationships with the Surinamese military. 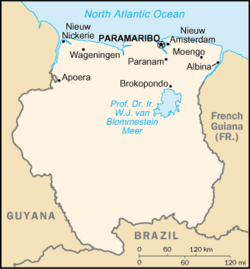 Suriname’s borders are porous; largely uninhabited, unguarded, and ungoverned rainforest and rivers make up the eastern, western, and southern borders, and the navy’s capability to police Suriname’s northern Atlantic coast is limited. Protecting natural resources from illegal exploitation such as unlicensed gold mining is difficult, and significant tax revenue is lost. Porous borders also make Suriname a target for transshipment of drugs. Since 2000, arrests and prosecutions of drug smugglers have increased, partially due to funding and training for police capacity through the U.S. State Department's Bureau of International Narcotics and Law Enforcement. On a Suriname river, 2005. Suriname’s economy has been dominated by the export of alumina, oil, and gold. Other export products include bananas, shrimp, fish, rice, and lumber. In 2006 alumina accounted for approximately 46.2 percent of total exports. Government income from the oil sector, however, has surpassed that of the bauxite/alumina sector. Suriname's bauxite deposits have been among the world’s richest. The severe shortage of affordable energy sources has hampered Suriname’s ability to expand its industries. This goes for the bauxite sector as well. To alleviate some of Suriname’s energy woes, the state-owned oil company, Staatsolie, built a 14 megawatt (MW) diesel-generated energy plant in 2006. In its most recently updated expansion plan, the company intends to expand the capacity of the plant to 18 MW. The gold mining sector is largely informal, unregulated, and small scale, but it constitutes an important part of the informal economy and must be brought into the realm of tax and environmental authorities. In the official sector the Gross Rosebel Goldmines, wholly owned by the Canadian firm IAMGOLD, commenced operations in 2004 and immediately positioned itself as the most productive and low-cost of all mines owned by IAMGOLD. A new player in the Surinamese gold sector is the U.S. firm Newmont Mining Corporation. Working in a joint venture with SURALCO, the company has indicated that it will be seeking a production license from the government of Suriname by 2008. Newmont wants to be operational by 2010. The reserves in the company’s concession area are estimated to be 300 million troy ounces. The sector with the most promising outlook for rapid, near future expansion is the oil sector. A 2000 study by the U.S. Geological Survey suggests that there may be up to 15 billion barrels of oil in the Guyana Plateau. The state-owned oil company, Staatsolie, is by law the only company with the right to operate; other companies can only access the market through production-sharing agreements with Staatsolie. With its current output at 14,000 barrels per day (bpd), Staatsolie announced a robust expansion plan titled “Vision 2020” that will seek to expand output to 18,000 bpd by 2012. Staatsolie also plans to expand its onshore exploration research to increase reserves by 30 million barrels per five years. In order to reach this goal, the company signed a production-sharing agreement with the Australian company Hardman Resources. Staatsolie further intends to establish and develop near shore reserves. In its offshore activities the company signed a production sharing agreements with the Spanish Repsol YPF (2004), the Danish Maersk Oil (2004), and the American Occidental Petroleum Corporation (2005). A second U.S. firm, Murphy Corporation, is expected to sign a production-sharing agreement with Staatsolie for offshore activities. Staatsolie expects 2008 to become the high point for Suriname’s offshore oil activities, with Repsol YPF drilling its first test well. In its “Vision 2020” Staatsolie also announced major expansion plans for its downstream market. The company wants to expand its refining capacity from 7,000 bpd to 15,000 bpd. Staatsolie also plans to put up its own retail business. In an effort to address the problem of Suriname’s ailing 110 parastatals, the government has introduced a plan that would strengthen them, after which they would be privatized. The first parastatals chosen for this experiment were the banana company, Surland, the wood processing company, Bruynzeel, and the rice company, SML. After closing for more than seven months in 2002, the banana company was reopened under the new name SBBS. After an initial attempt to privatize the company failed in 2005, the government continued the restructuring of the company. With heavy financing from the European Union the company has been revitalized but is not yet out of debt. In 2006 SBBS produced and exported at record quantities. The management of the company is currently in the hands of a French company. The government has not announced any new plans for privatizing the company. The privatization attempt of the wood processing company, Bruynzeel, has failed. The government is currently considering its options. A British firm, the Emerald Investment Group, has expressed an interest in the company and has made a tentative offer to the government. The government has not indicated what it plans to do with the company. The restructuring of the heavily indebted rice company SML has failed. The company has also been involved in legal proceedings brought by one of its largest creditors. In May 2007, the government announced that it would go ahead with the sale of the company. A call for proposals was published in the daily newspapers. Indications are that the government might go ahead and accept any bid that would cover the company’s extensive debt. The population growth of Suriname. Note: The y-axis is the number of inhabitants in thousands. Suriname's population of 438,144 (July 2005 estimate) is made up of several distinct ethnic groups. East Indians (known locally as Hindoestanen) form the largest group at 37 percent of the population. They are descendants of nineteenth-century contract workers from India. The Creoles (about 31 percent of the population) are the descendants of West African slaves, mixed with whites. The Javanese (descendants of contract workers from the former Dutch East Indies on the island of Java, Indonesia) make up 15 percent. Maroons (descendants of escaped West African slaves) make up 10 percent and are divided into five main groups: Aucans, Kwinti, Matawai, Paramaccans, and Saramaccans. Amerindians form 3 percent of the population (some say as low as 1 percent), the main groups being the Akuriyo, Arawak, Carib/Kaliña, Trío and Wayana. Jews, both Sephardic and AshkenaziEast European. Because of the great number of ethnic groups in the country, there is no main religion. Christianity, both Roman Catholicism and variations of Protestantism, is dominant among Creoles and Maroons. Most of the Hindustani are Hindu, but they also practice Islam and Christianity. The Javanese also practice both Islam and Christianity. At 20 percent of the population, Suriname has the largest Muslim community by percentage in the New World. Despite the religious diversity, the makeup of Suriname's population is very similar to that of neighboring Guyana, with the exception of the Indonesian population (which Guyana lacks). French Guiana, as part of France, does not collect ethnic statistics. 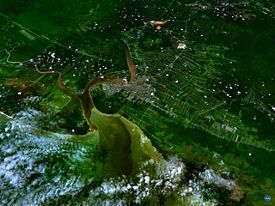 The vast majority of people (about 90 percent) live in Paramaribo or on the coast. There is also a significant Surinamese population in the Netherlands. In 2005 there were 328,300 Surinamese people living in the Netherlands, which is about 2 percent of the total population of the Netherlands (compared to 438,144 in Suriname). Dutch is the official language of Suriname, but Sranan Tongo serves as the lingua franca. Initially the native speech of the Creoles, Sranan Tongo is an English language-based creole language (due to over 20 years of British presence) with a large influence from Dutch and several other languages, including Spanish, Portuguese, West African languages, and several indigenous languages. Sarnami Hindi is the third largest language of the nation. A form of Bihari, a dialect of modern India's Hindi language, it is spoken by the descendants of British Asian contract workers. Javanese is spoken by the descendants of Javanese contract workers. Maroon languages are somewhat intelligible with Sranan Tongo. Some are based on Portuguese rather than English. Maroon languages include Saramaka, Paramakan, Ndyuka and Aukan, Kwinti and Matawai. Amerindian languages are spoken by the Amerindians of Suriname. These languages include Carib and Arawak. Hakka Chinese and Cantonese are spoken by the descendants of the Chinese contract workers. Mandarin is spoken by more recent Chinese immigrants. Additionally, English and, to a lesser extent, Spanish are also used, especially at tourist-oriented facilities or shops. Due to the mix of population groups, Surinamese culture is very diverse. Nearly 90 percent of the adult population can read and write (male: 92 percent; female: 87.2 percent). The nation's many immigrants have left culinary traces. The only truly national dish is chicken and rice. In Paramaribo, Javanese and Chinese cuisine and restaurants are popular. In the countryside, breakfast consists of rice (for the Javanese), roti (Hindustani), or bread (Creoles). The main meal is eaten at 3 p.m., after offices have closed. After a siesta, sandwiches and leftovers are eaten. Some of the greatest football players to represent the Netherlands, such as Frank Rijkaard, Ruud Gullit, Patrick Kluivert, Clarence Seedorf, Aron Winter, Jimmy Floyd Hasselbaink, Stanley Menzo, and Edgar Davids, are of Surinamese descent. Davids in particular has written of his passionate pride in his Surinamese heritage and his love of attending soccer matches there. There are a number of local heroes in other sports as well, like Primraj Binda, best known as the athlete who dominated the 10 km race for nearly a decade, Steven Vismale, and Letitia Vriesde. Another notable track athlete from Suriname was Tommy Asinga. Anthony Nesty is the only person to win a medal (for swimming) for Suriname at the Olympics. Originally from Trinidad, not Suriname, he now lives in Miami, Florida. Suriname is the setting for the largest part of Aphra Behn's classic novella, Oroonoko. The 1962 film, The Spiral Road, directed by Robert Mulligan and starring Rock Hudson, was filmed in Suriname (then Dutch Guiana). Chapter 19 of Voltaire's classic Candide is set in Suriname. Suriname was featured in the TV series E-Ring. Golden Globe and Emmy-winning American actor Jimmy Smits (born in New York City in 1955) was born of a Surinamese father, Cornelis Smits, who immigrated from Dutch Guiana. ↑ 1.0 1.1 Central Intelligence Agency (2009). Suriname. The World Factbook. Retrieved October 26, 2011. ↑ Algemeen Bureau voor de Statistiek in Suriname - Census profile at district level Retrieved October 26, 2011. ↑ 3.0 3.1 3.2 3.3 Suriname. International Monetary Fund. Retrieved October 26, 2011. ↑ Yvonne Yazbeck Haddad, Jane I. Smith, Muslim Minorities in the West: Visible and Invisible, 271. CIA World Factbook. Suriname. Retrieved December 14, 2007. Countries and their Cultures. Culture of Suriname. Retrieved December 14, 2007. U.S. State Department. Background Notes: Suriname. Retrieved December 14, 2007. This page was last modified on 5 November 2015, at 23:44.